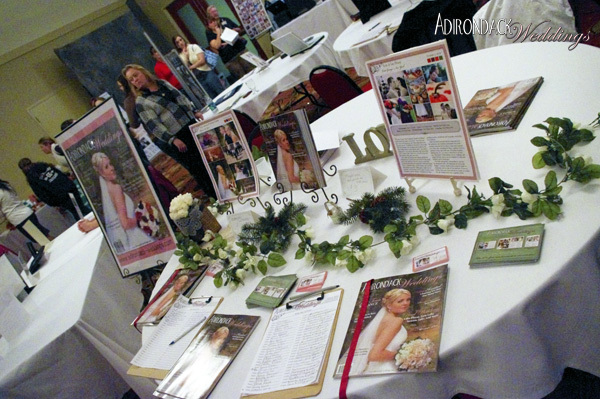 At Adirondack Weddings magazine, we attend a lot of bridal shows. 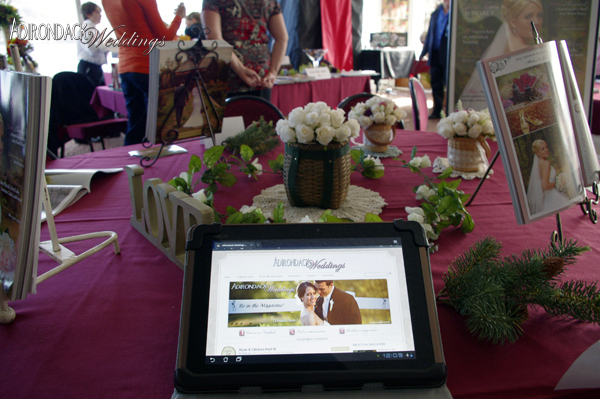 We love meeting engaged couples in person, and boy, have we ever done that–since January 2011, we have met more than 1,200 local brides! 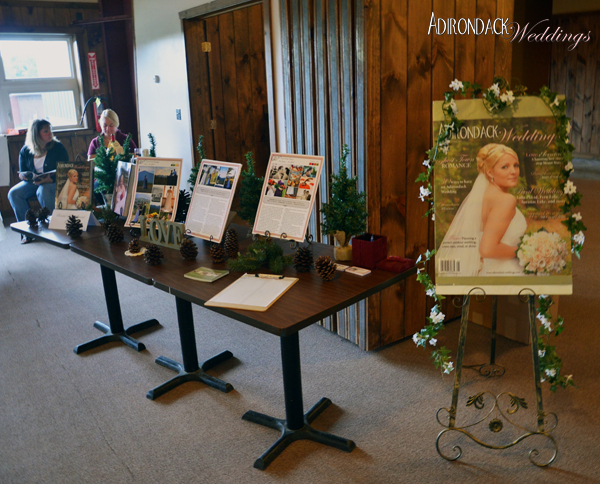 In our mission to provide the area with a gorgeous bridal resource, we have traipsed from the heart of the Adirondacks (Speculator), to the western edge of the park (Lowville), to the northern tip (Altona) and down to the Capital Region. Additionally, we’ve attended multiple shows in one of our region’s best-known villages, Lake George. Here are a collection of some of our favorite images from five different shows. 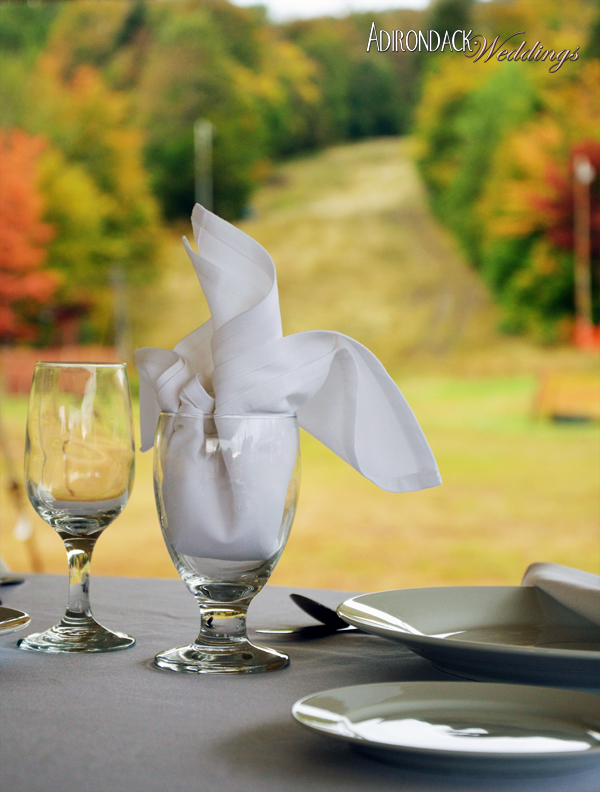 We begin with a beautiful September 2012 day at Oak Mountain Resort in Speculator, where the leaves were already changing. Check out this view from under the tent! The spacious main lodge provides the perfect canvas for a variety of wedding decoration styles–you could go rustic, elegant, traditional, or a combination. Next up is October’s AWA show in Lake George, where we busted out our 8-foot displays of both covers. Cree the wolf was practically life size! 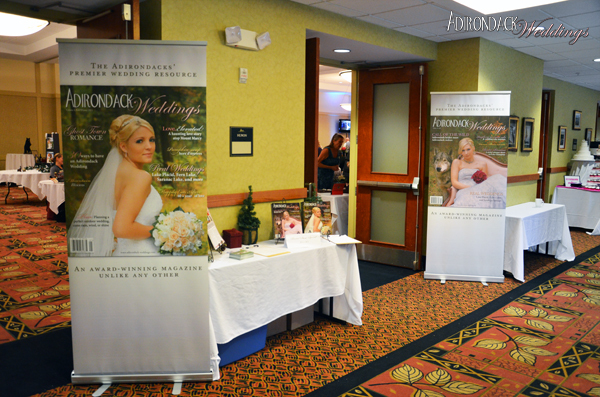 And below, from last fall, is our display at The Georgian Resort’s bridal show. 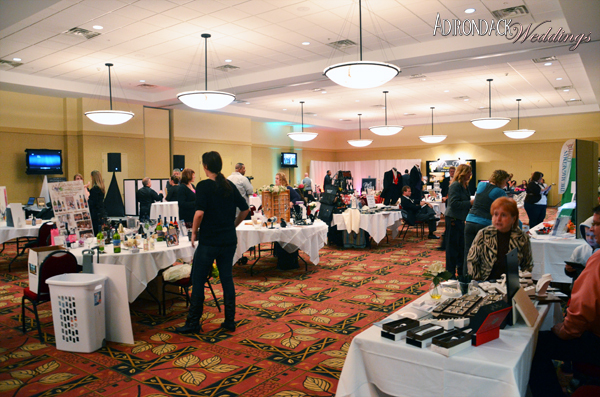 We were too busy manning the booth to take photos of the scenery, which is too bad, because the ballroom sits directly on Lake George and has a killer view of the lake. Hey, look, we are high tech! 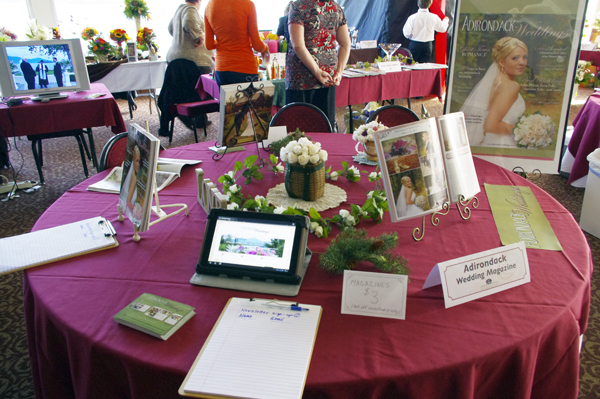 Showing off our website right from the table. 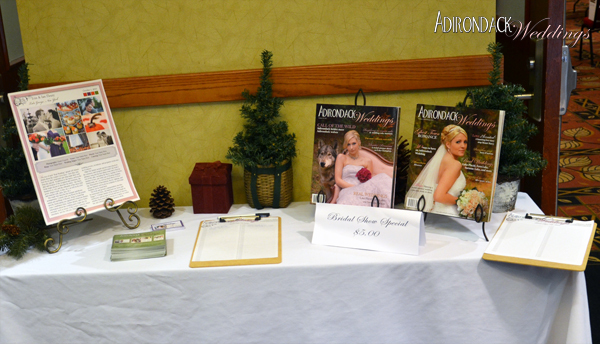 Below are photos from the Lewis County bridal show, which was the first show we attended, all the way back in January 2011. We took a snowy, beautiful drive through the Adirondacks that weekend, passing so many beautiful towns and villages including Star Lake, Cranberry Lake, Tupper Lake, and Saranac Lake. 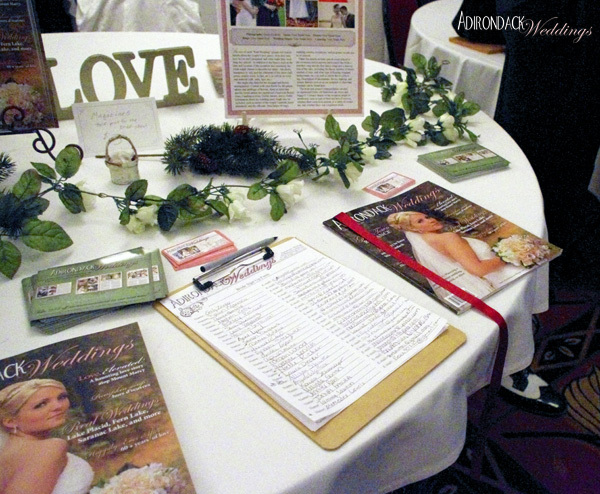 On the same weekend, we stuffed packets for brides attending bridal shows in Canton and Altona. 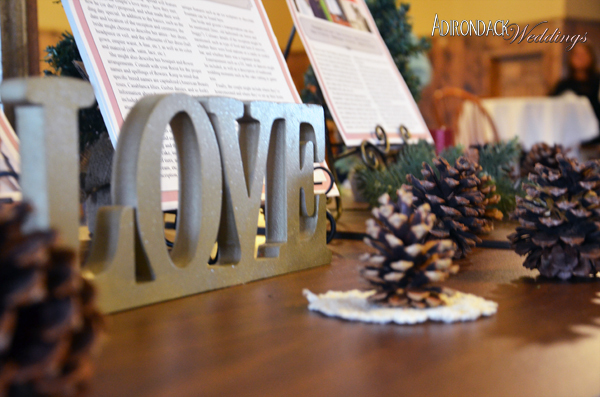 Last but not least, here is our display at last fall’s AWA show, also in Lake George. As you can see, we keep busy! 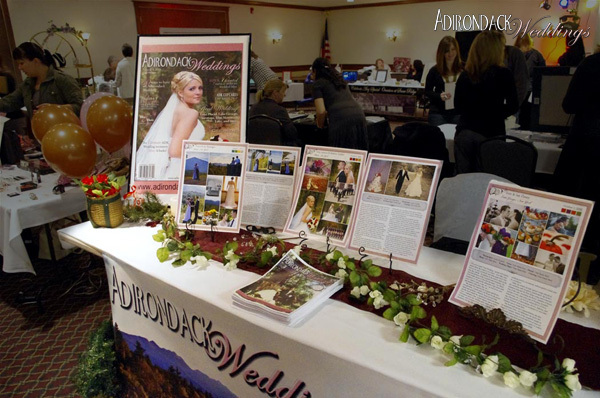 With our newsstand reach, we are the foremost way destination couples get their information about getting married in the Adirondacks, but that doesn’t mean we neglect the couples who live right here. We’ll keep you updated on the shows we plan to attend, both here and on our Facebook page. But no need to wait for a show if you’d like to get in touch; our inbox is always open! Bridal shows are so much fun! I’ve done events like this before. I like your set-up it looks really nice. It’s been a while since I’ve been to a bridal expo. My sister is a florist and I know she has been to a few recently though. Bridal shows are a really fun time! !